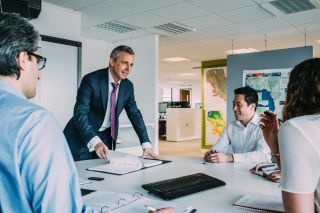 CIOs have an increasing amount of responsibilities as they help engage new customers and lead their organisation's digital transformation efforts. It’s no secret that we’re doing business in a fast-paced, disruptive environment. To keep pace with rapid change, IT is becoming more strategic, and expectations are growing. And the CEO and other business execs are turning to the CIO to lead digital transformation, engage and win new customers, and ultimately drive revenue. CIOs are feeling the weight of these new responsibilities, and they believe that it’s more important than ever to closely align IT with business imperatives. In a recent study by the Society for Information Management (SIM), 42 percent of participants cited alignment with business as their top priority (SIM International, “Taking the Pulse of IT,” 2017). But balancing traditional IT responsibilities with today’s new transformational challenges isn’t easy. Let’s take a closer look at three key drivers to help you support your company’s business objectives. For example, one of our clients, Color Spot Nurseries, a $300 million wholesale grower that supplies plants to big-box stores, has been running its SAP system since 2000 to support its core business operations. However, its support costs through SAP had been steadily growing for years. SAP does not support the company’s customizations, and the support packs and major upgrades the IT organization was required to install to remain in compliance with the maintenance and support contract were expensive and delivered no perceived value to its business. To get the support it required to keep its most important business processes running smoothly, Color Spot partnered with us, and cut its overall maintenance and support costs by more than half. This support solution helps ensure that Color Spot’s business platform consistently delivers the highest performance and availability and includes support for Color Spot’s customizations — something SAP didn’t offer. Driving fast innovation is top of mind in an environment of digital disruptors. If you can’t capitalize on new opportunities and get your new ideas to market, your competitor almost certainly will. In the SIM International study, innovation agility occupied three of the top five most important IT management concerns. For instance, we’re hearing a lot of buzz about the potential of hybrid IT — running existing, non-cloud IT infrastructure alongside new public cloud innovative solutions — then gradually migrating high-value, engagement systems to the public cloud over time. Your ERP business platform is the foundation of a hybrid IT strategy as the “system of record” with cloud “systems of engagement” rapidly deployed as needed to support business initiatives. For systems where there is no pressing need to move onto a cloud infrastructure, it makes more sense to avoid the expense of migrating until it is necessary. If a major event occurs, such as the need to completely replace an aging data center or a major business process or organizational change, organizations might be pushed into moving to the cloud. According to Leong, organizations shouldn’t start by deciding on the computing infrastructure they will use, but on what type of IT will best meet the needs of different parts of the business. Infrastructure and operations (I&O) makes up two-thirds of overall run IT costs, so targeting the costs required to “keep the lights on” is a good place to start. Gartner and other industry analyst firms recommend enterprise software support as a potentially ripe category for cost savings. For example, outdated vendor support models may drive your total cost of maintenance to at least twice the price of your vendor annual support fees. With the right approach, you’ll be able to optimize the costs required to run and maintain your core ERP systems and free up additional funds to grow your business and stay ahead of competitors.